Description - These Grooved Edge Boards are built wide at 8" in size to provide a unique look to any outdoor space. These outdoor decking boards are a wonderful, natural looking alternative to traditional wood decking that can be high maintenance. Backed by a 25 year warranty, you are sure to love these low maintenance planks for years to come. Weight – 45.48 Lbs. per board. Recommended Uses – Grooved Edge Boards - Wide are recommended for a variety of outdoor areas, including patios, verandas, around pools and hot tubs, around fireplaces and more. 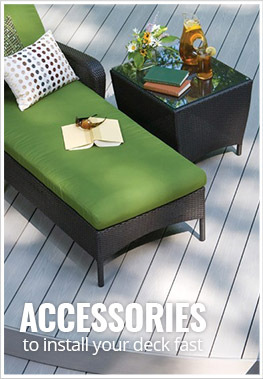 For detailed and printable deck board installation instructions, please Click Here.